The Cambodian ambassador to the Philippines was summoned by the Department of Foreign Affairs but he snubbed the DFA summons and sent his deputy instead, who was handed a note verbale. The DFA wanted an explanation from the Cambodian Ambassador Hos Sereythonh on what he had written about the “inflexible and non-negotiable position” of the Philippines and Vietnam on the South China Sea row that resulted in the failure of the 10-member Association of Southeast Asian Nations (Asean) to issue a traditional joint communiqué at the end of its ministerial meeting in Phnom Penh, Cambodia two weeks ago. The Cambodian Embassy’s second secretary Tan Chandaravuth, was handed the note verbale by Foreign Affairs Undersecretary Erlinda Basilio to express the Philippine government’s displeasure over the ambassador’s comments and demanded that he explain his comments published in a local newspaper. It appears that the Cambodian diplomat included an accusation that the Philippines and Vietnam played “dirty politics” in trying to solve a maritime row with China. The comments were in a letter Hos sent to the editor of a newspaper last Monday. MANILA – While the nation grapples with heavy rains and the widespread floods it invariably brings, after the country has been severely deforested, Filipinos are being treated to what the progressive and patriotic groups scorn as a badly choreographed prelude to chacha or charter change. The chacha proposals on the table revolve around “only the economic provisions,” the proponents promised. They would “only” remove restrictions to the inflow of foreign investments into the country, and disengage from the political rider of term extension that led to the wholesale rejection of first charter change initiatives. “Aquino wants to build the path of least resistance for their ‘chacha’ maneuvers by projecting itself as disinterested while building consensus among the reactionaries to swiftly carry-out ‘chacha’,” the Communist Party of the Philippines said in an emailed statement. Indeed, for weeks until last Monday, President Benigno “Noynoy” Aquino III reportedly played cool to charter change suggestions by both leaders of the Senate and the House of Representatives. Mainstream media reports portrayed Aquino as someone who has to be convinced in a meeting in Malacañang last Monday with Senate President Juan Ponce Enrile and Speaker Feliciano Belmonte before he “gratified” the leaders of Congress by showing openness to charter amendments, and telling his economic managers to study the proposals for amending the economic provisions of the 1987 constitution. But based on his economic policies, Aquino is just as interested in pushing for charter amendments as the other past presidents who had tried, but failed, because they had also pushed for term extension in the amendment proposals. In a bid to make charter change acceptable, the Aquino administration is now seen as trying to shed off the oft-rejected political rider in past initiatives. But critics from progressive and patriotic groups are still not swayed. 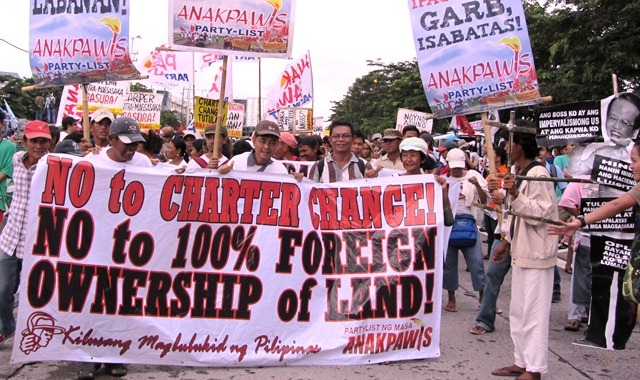 From their statements, they are one in pointing out that aside from the fact that the track record of both chambers of Congress and President Aquino shows that they cannot be trusted to do what they promised they would – this is the Congress that “passed obnoxious laws such as the Oil Deregulation law and the EPIRA” – the economic changes they now want to push through charter amendments are in itself “a recipe for disaster” for most Filipinos. Someone mentioned the phrase “responsible parenthood” with pride and gusto. He said it decidedly and clearly. He invoked it before an elite crowd — with the general public hearing it. He got a loud and long applause from his direct audience — most of whom are interested in getting not only his political but also his administration’s financial support. He thus immediately moved and inspired his comrades to meet, plan and strategize for the passage of the famous as well as infamous RH bill — depending on whether the bill is simply about lobby money, business profit, PPP enterprises or the issue is basically about ethical considerations and/or moral principles. That is why the following sceneries immediately came to fore: On the one hand, those in favor of the bill are flexing their muscles, planning their strategies and programming their moves for its eventual approval. A horrifying amateur video from Syria emerged online, showing an apparent mass execution of pro-government forces in Aleppo at the hands of rebels from the Free Syria Army. While Julian Assange is awaiting Ecuador’s decision on his appeal for political asylum, his mother Christine has traveled to the country to discuss her son’s fate with President Rafael Correa. She spoke about the ongoing case with RT Spanish. ­Julian founded Wikileaks to help people living under repressive regimes bypass government censorship, Christine said. No government or group had stopped or hindered his efforts until he began publishing leaked US documents. MANILA — The Pambansang Lakas ng Mamamalakayang Pilipinas (Pamalakaya) has issued a demand that the Benigno Aquino III administration stop its plans to ask the United Nations to send a peacekeeping force and help keep China in check in relation to the conflict involving territorial rights over the West Philippine Sea and the group of islands collectively known as the Spratly Islands. Recently, Muntinlupa Rep. Rodolfo Biazon said Malacañang should appeal to the UN for help and keep China and its naval forces from occupying the disputed islands. He said the territorial dispute between China and the Philippines can and should be settled with the help of the UN. Recent reports have it that a large fleet of Chinese fishing vessels have been spotted nearPag-asa Island. He said the request for deployment of UN peacekeeping forces could be included in the case the Department of Foreign Affairs (DFA) intend to file with the International Tribunal for the Law of the Sea (Itlos) for the settlement of the Philippines’ dispute with China over Panatag Shoal. All this is based on the United Nations Convention on the Law of the Sea (Unclos). Biazon was a former Chief of Staff of the Armed Forces of the Philippines (AFP) under the Corazon Aquino administration and current chairman of the House Committee on national defense. According to Wikipedia, the term “peacekeeping” is not found in the UN Charter, but the authorization is generally considered to lie in or between Chapter 6 and Chapter 7 of the same. Chapter 6 describes the Security Council’s power to investigate and mediate disputes, while Chapter 7 discusses the power to authorize economic, diplomatic, and military sanctions, as well as the use of military force, to resolve disputes. The founders of the UN envisioned that the organization would act to prevent conflicts between nations and make future wars impossible. Pamalakaya vice chairperson Salvador France, in a statement, called the proposal “impractical and dangerous.” He said even as his group takes a stand against China’s excursions and bullying attempts, it is against suggestions to bring in UN peacekeeping forces to the Spratlys. Instead of preventing any possibility of a conflict erupting between the Philippines and China, he said, Biazon’s proposal could serve to complicate the political-territorial dispute. “We cannot dismiss the possibility that along with UN peacekeeping forces, there will also be troublemakers from the Pentagon and from other junior partners of the US,” France said. The fisherfolk leader said suggestions such as those posed by the Muntinlupa congressman might serve to increase the tension between China and the Philippines and justify the increasingly aggressive presence of US military forces in the country. He said the country’s leaders should consider other rational and more workable solutions to address and resolve the West Philippine Sea conflict. “They should stop fueling distrust and aggravating the situation in accordance to the game plan of US in Spratlys and in Asia and the Pacific region. By all means, the Aquino government should explore all available diplomatic venues and channels to end the long-running conflict with Beijing, instead of toeing the US’ line on the issue. It’s crucial that Malacañang asserts the country’s national sovereignty and territorial integrity, but it should do so without obeying US impositions and Washington dictates. The Philippines cannot negotiate effectively if we are doing so not on the strength of people’s sovereignty but on the whims and caprices of the United States,” he argued. For all of its stand against Biazon’s first proposal, Pamalakaya however gave a thumbs up to the lawmaker’s call to file a case before the International Tribunal for the Law of the Sea (Itlos) to resolve the dispute. It also echoed Biazon’s stand that Malacañang should drop plans to buy warships and aircraft and instead pursue the case before the UN body. The Unclos is signed by 152 nations, including China and the Philippines. The former, however, refuses to recognize the latter’s sovereignty over territories in the West Philippine Sea that are within the country’s 370-kilometer exclusive economic zone, insisting instead that these islands are included in Chinese territory. The Beijing government does not want international arbitration to settle the dispute, but is pushing bilateral talks with the Philippines, as well as with other countries also claiming ownership over West Philippine Sea territories. MANILA — Are military personnel involved in large-scale, illegal logging operations in the country? The Pambansang Lakas ng Kilusang Mamamalakaya ng Pilipinas (Pamalakaya) is convinced that this is a possibility. It advised Department of Environment and Natural Resources (DENR) Secretary Ramon Paje to launch investigations into the matter. Pamalakaya national chairman Fernando Hicap said the DENR’s supposed campaign against illegal logging in the country has not been successful because the agency, for the longest time, has been turning a blind eye on the activities of the military when it comes to logging. He said the Armed Forces of the Philippines (AFP) should not be used in the fight against illegal logging because many elements and even ranking official AFP officials serve as protectors of logging syndicates. The Commission on Elections (Comelec) has caused the postponement of the hearing on the electoral sabotage case filed against former President Gloria Macapagal Arroyo. This after the Comelec failed to furnish the counsel of the former President with a copy of its Motion for Reconsideration on the decision of the court to grant bail to Mrs. Arroyo three days before the scheduled hearing today at the sala of Pasay City Regional Trial Court Judge Jesus Mupas. The hearing today was supposed to tackle the motion for reconsideration filed on the grant of the bail petition of the former President. The Rules of Court require a party-movant to furnish the adverse party with copy of the motion at least three days before the scheuled hearing to give them to prepare, otherwise their motion will be considered as not filed. Esmeralda Ladra, lead prosecutor, said they furnished lawyers Benjamin Santos and Ray Montri Santos, counsels of Mrs. Arroyo, last Thursday only via registered mail. President Aquino has given the special cluster on Charter change (Cha-cha) two weeks to wrap up a process embarking on the task to identify, study, expound and make the appropriate recommendations on the clamor pushing amendments in the 1987 Constitution. At the anniversary rites of the Bureau of Internal Revenue where the President was guest speaker, Finance Secretary Cesar Purisima yesterday confirmed that the President has given them two weeks to finish the task which would help him come up with a decision either to maintain his position against constitutional amendments or otherwise. Purisima told Palace reporters that the President appears to be interested in economic provisions in the Constitution limiting foreign ownership of businesses. With the Catholic Church leaders flexing their muscle with a show of force through a planned huge mass protest against the Reproductive Health (RH) bill renamed by the Palace as the Responsible Parenthood (RP) bill, President Aquino, speaking through his official spokesman, Edwin Lacierda, took a new approach in portraying the Church and its leaders as unpatriotic with congressmen who will pass the RH bill as true Filipino patriots who think only of the country and the Filipino’s future — his future children. Days before the much anticipated congressional showdown determining the fate of controversial bill referred to by the President as the RP bill, presidential spokesman Edwin Lacierda hinted at a scenario where the Church would portray congressmen who would cast a vote in the service of the country, could face an imminent blacklisting by a Catholic Church group seen in recent weeks as threatening to dump legislators in time for the 2013 midterm election. One of the sponsors of the controversial Reproductive Health (RH) bill yesterday renewed her tirades against the Senate leadership for sitting on the measure, accusing them of using their position to prevent its approval in the upper chamber. Although Sen. Pia Cayetano did not mention any names, it was apparent that she was addressing Senate President Juan Ponce Enrile and Majority Leader Vicente Sotto III in telling them to detach themselves from their personal views and functions in the legislature in dealung with the measure. Cayetano, one of the sponsors of RH bill in the Senate, seemed to be already frustrated with the current status of the measure in the upper chamber, having been not placed in the order of business since Congress reconvened last July 23, almost two weeks ago, despite of it being among those mentioned by President Aquino in his State of the Nation Address. Matinee idol Richard Gutierrez has lost his case before the Court of Appeals (CA) in connection with the car accident three years ago during which his personal assistant was killed. The appellate court through Associate Justice Stephen Cruz ordered the filing of criminal information of reckless imprudence resulting in homicide against Gutierrez in connection with the May 22, 2009 vehicular accident in Silang, Cavite. In its eight-page decision, the CA set aside the resolutions issued by the Department of Justice (DoJ) dismissing the charges filed against Gutierrez by Lorayne Pardo, widow of the actor’s personal assistant Norman Pardo. Some 1,300 families yesterday fled their homes and sought refuge at temporary shelters put up by the city governments of Malabon, Navotas and Valenzuela after the main river overflowed and dikes collapsed, catching the local officials and residents by surprise. The massive evacuation of affected families was immediately ordered, especially in Navotas and Malabon areas after the Tullahan River overflowed due to the strong rainfall early yesterday morning which was worsened by high tide that reached its peak at 2.2 meters around 9 a.m. yesterday. Navotas Mayor John Rey Tiangco in a text message to Tribune said nearly 600 families were evacuated to several schools and covered courts converted into their temporary shelters after their houses were inundated by floodwaters.